I am trying to add the jtwitter jar to my project. 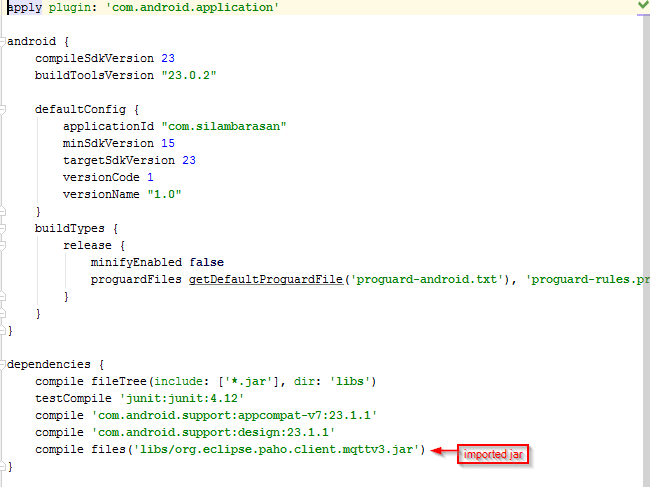 I researched and found that android-studio has some issues and that you have to edit the build.gradle file yourself. Another question, where would the libs folder be. Does it mean the External Libraries? 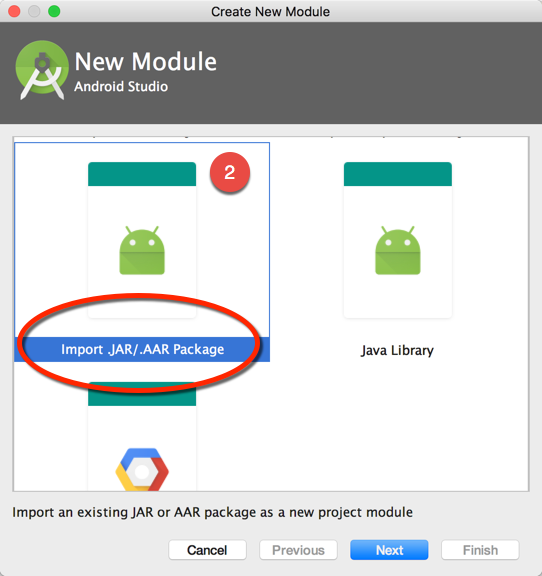 The easy and correct way to import a jar/aar into your project is to import it as a module. Create libs folder under the application folder. Add .jar files to libs folder. 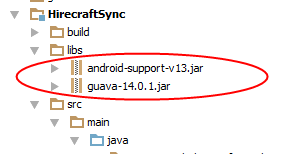 Then add .jar files to app's build.gradle dependency. Finally Sync project with Gradle files. Finally add .jar files to your application. 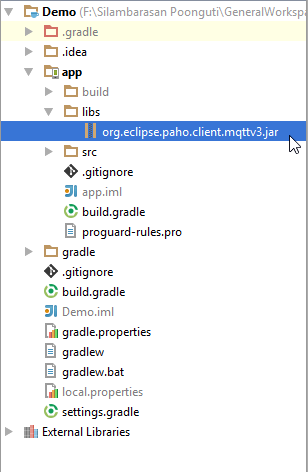 Here I'm going to import org.eclipse.paho.client.mqttv3.jar file to our app module. Copy your jar file and paste it in directory called libs. Press Ctrl + Alt + Shift + s or just click project structure icon on the toolbar. 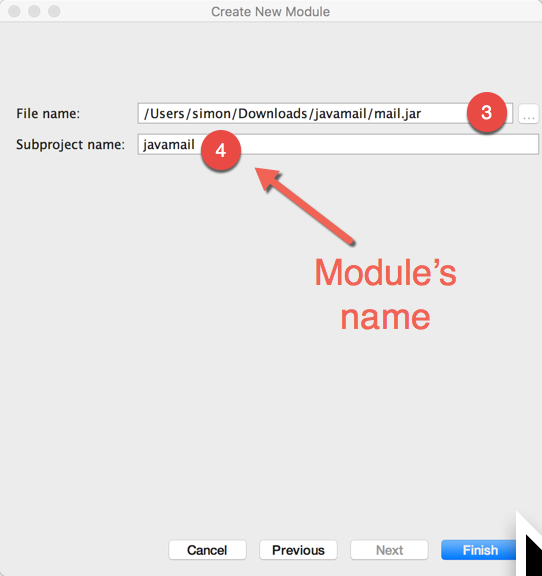 Then select your module to import .jar file, then select dependencies tab. 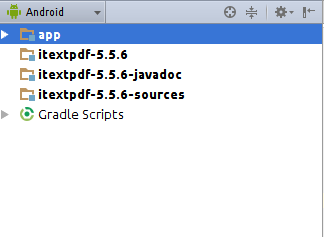 Select .jar file path, click OK to build gradle. Finally we're imported .jar file to our module. 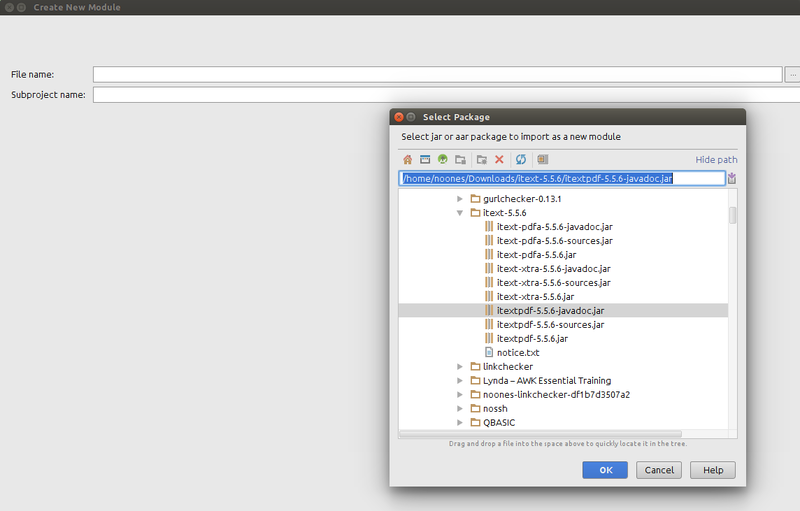 2) New Window appears ,,There you have to choose the Import .JAR/.AAR package . 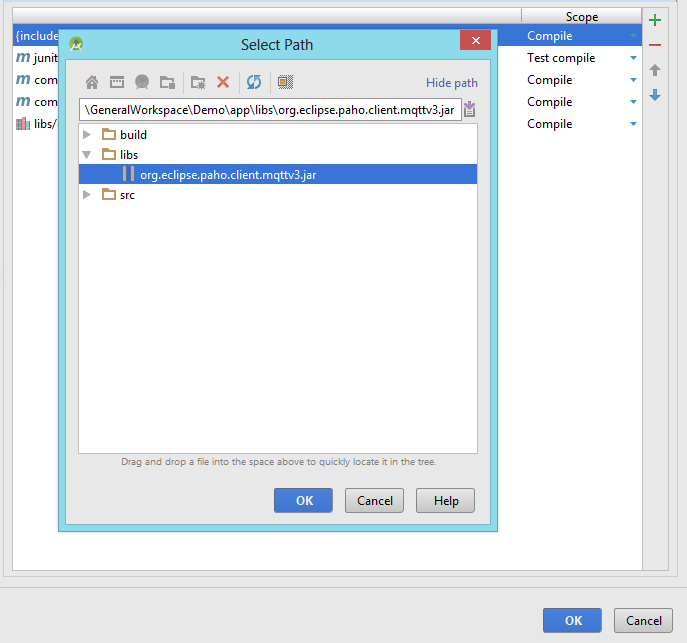 3) Click on the path option at the top right corner of the window ...And give the whole path of the JAR file . 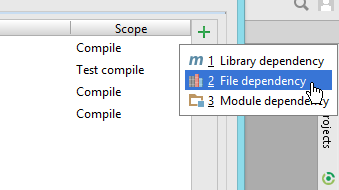 2)Click on dependency at the top right corner of the current window . 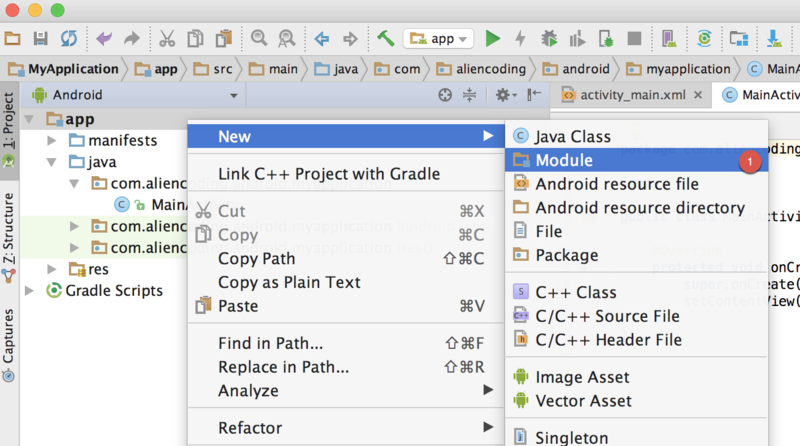 Android Studio 1.0 makes it easier to add a .jar file library to a project. Go to File>Project Structure and then Click on Dependencies. Over there you can add .jar files from your computer to the project. You can also search for libraries from maven. The following the menu path: File -> Project Structure -> Dependencies -> Add -> File Dependency, Android Studio opens a dialog box where you can drag&drop the jar library. Then I clicked the OK button. At this point Gradle will rebuild the project importing the library and resolving the dependencies. I see so many complicated answer. 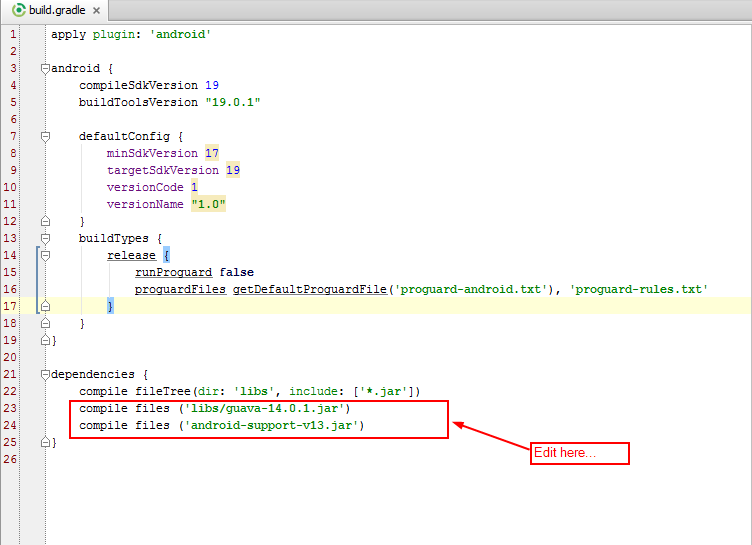 All this confused me while I was adding my Aquery jar file in the new version of Android Studio. 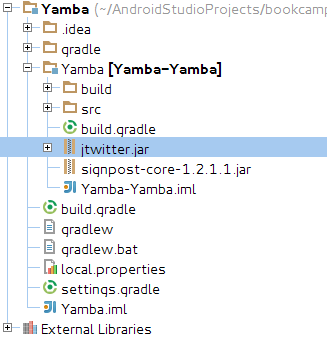 Copy pasted the jar file in the libs folder which is visible under Project view. 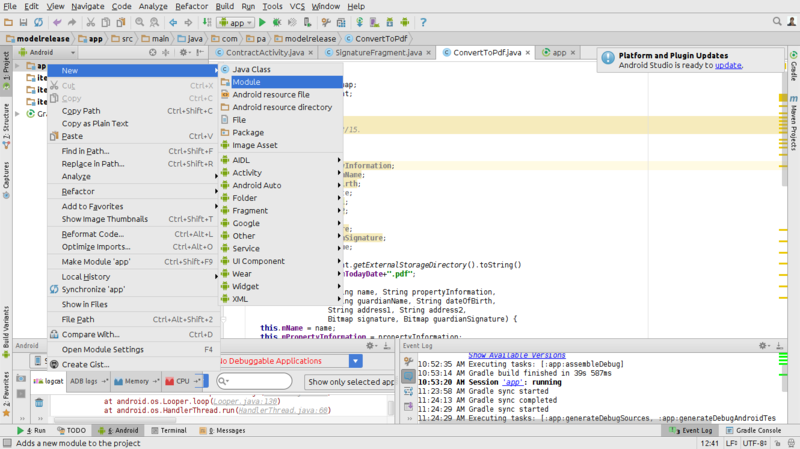 If the code for your jar library is on GitHub then importing into Android Studio is easy with JitPack. JitPack acts as a maven repository and can be used like Maven Central. The nice thing is that you don't have to upload the jar manually. Behind the scenes JitPack will check out the code from GitHub and compile it. Therefore it works only if the repo has a build file in it (build.gradle). 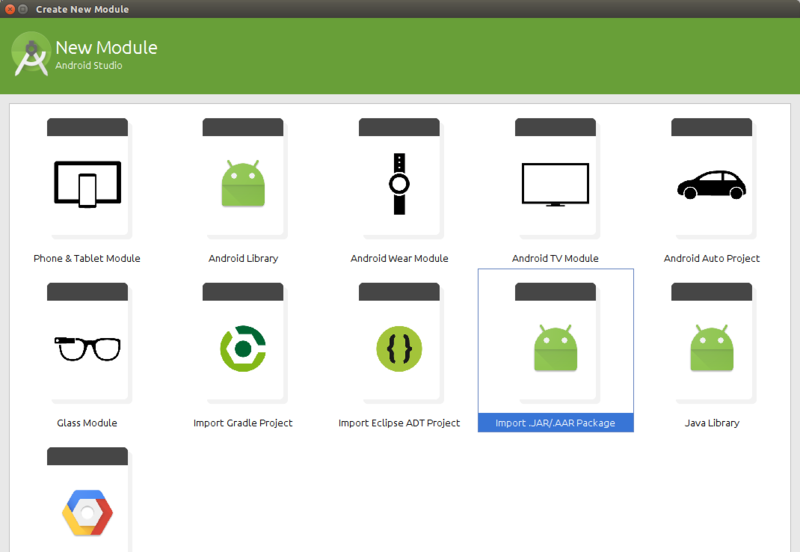 There is also a guide on how to prepare an Android project. I also faced same obstacle but not able to find out solution from given answers. Might be it's happening due to project path which is having special characters & space etc... So please try to add this line in your build.gradle. ".." (Double dot) will find your root directory of your project.